It does not seem possible that the mid season break is upon us as it seems like just yesterday that we were still waiting for the premiere to start after a long summer of repeats. However, it is a reality we must face when this Friday brings us the Winter finale and episode 11 which is really close to the half way-point. This is the first time the show has presented the fans with a winter finale and according to EP Peter Lenkov, there will also be a cliffhanger for the first time. Guess this will also be the holiday episode this year based on the promo and info so it will be a great present for the fans. Here is the promo, press release, and screencaps to get you ready. “Ka’ili aku” – Five-0 races to Mexico where Chin puts his life on the line after his niece Sara (Londyn Silzer) is kidnapped, on HAWAII FIVE-0, Friday, Dec. 16 (9:00-10:00 PM, ET/PT) on the CBS Television Network. Duane “Dog” Chapman returns as himself and George Takei returns as Chin’s Uncle Choi. 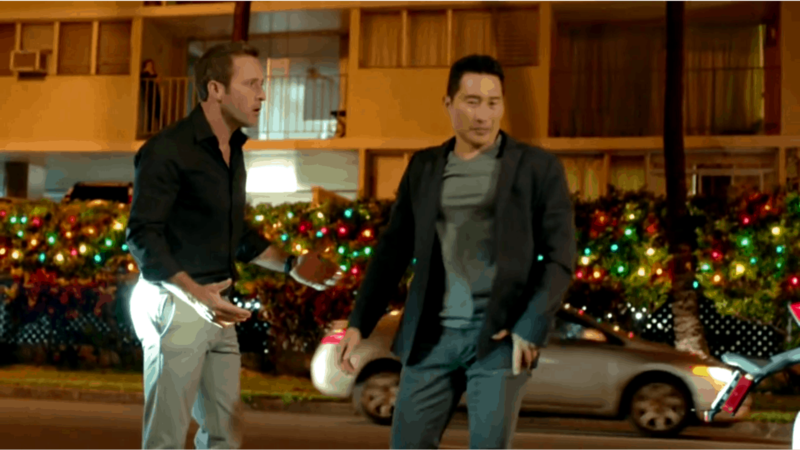 From the screencaps (as well as BTS pic back to when they shot this episode) we will also get some badass McGarrett and team! Yea! Got to love Ninja Steve. We are not ready for the break but are ready to see this action packed episode with the whole Ohana working towards saving one of their own.